Rainforests do not have to be hot. Winds sculpt trees into natural umbrellas over the trail. Please help us keep the rainforest pristine, do not climb trees, pick plants or damage tree bark along the trail! Leave no trace of your visit. As you walk the trail look closely at the abundant vegetation that thrives in the constant moisture where the ocean breeze meets the sudden rise of the coastal mountains. This confluence creates a narrow temperate rainforest zone that varies very little in temperature year-round. 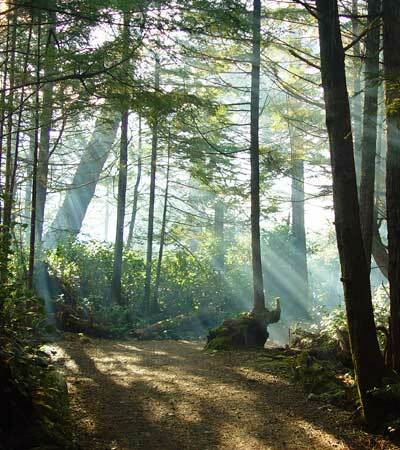 The best place to visit for the star of the rainforest is the Ancient Cedars Trail section. You will see giant Western red cedars (huumiis), a species that has long been acknowledged as the tree of life for indigenous peoples. These life-giving cedars -- called 'huumiis' in the Nuu-chah-nulth language -- provided rot-resistant canoes and building materials, and the bark was used to make: rope, clothing, hats, baskets, and even medicine. Learn more at this UBC link. Older cedar trees often have "widow makers" or dead branches in their crowns that make the trees look like candelabras. Not only are Western red-cedar unique in their shape and form, but they are also the largest trees in BC's coastal forest. In coastal sections note the tall straight Sitka spruce (tuhamapt), which are uniquely designed to process the salt spray so they provide a shelter for more sensitive growth under their tall canopy. Watertight baskets and twine can be woven from spruce roots. The pitch was historically used as an effective medicine for burns and other skin irritants. Spruce needles are great collectors of moisture in the fog. Note how damp the trail is under these trees during summer droughts. 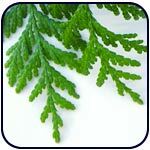 These trees are easy to identify for their fish-scale-like bark and sharp-to-touch needles. 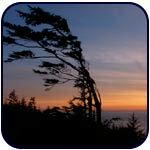 Big Beach and coastal sections of the trail are the best place to see these trees. Western hemlock (qʷiƛaqmapt ) grows well on decaying conifers, and can often be found growing in the crook of giant cedars. 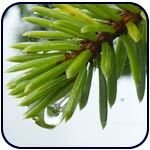 They can be recognized from their “droopy” top branches and flat needles. First Nations continue to use hemlock branches to harvest herring eggs deposited on shoreline. 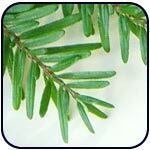 Hemlock needles, which contain vitamin C, were boiled for a tea that could cure scurvy. 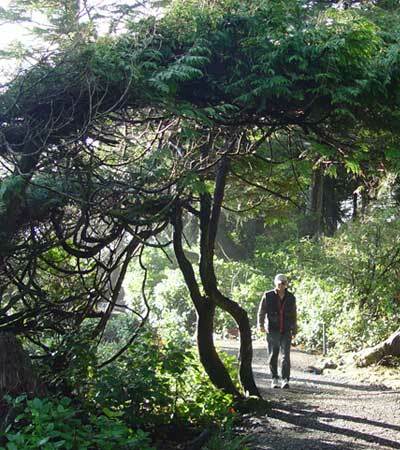 As you walk the trail look for bonzai-like trees that grow dramatically twisted and bent due to the pruning effect of salt spray and force of the wind at the ocean’s edge. Scientists call this the Krummholz effect. The trail often tunnels under this dense canopy. Also look for trees growing on nurse logs. Heavy rain washes away nutrients in the soil so most plants grow on the decay of previous generations. Many older trees stand on their tippy toes because the nurse log has finally rotted away. Despite its hardy nature, this pristine rainforest is easily susceptible to human impacts. Please stay on the trail to avoid crushing plants. Even giant trees can suffer damage to roots and bark. Rainforests provide key habitat for wildlife and over 300 species of resident and migrating birds. Preserve this experience to be enjoyed by others long into the future by taking only photographs and great memories away with you. To learn more: hww.ca — spacesfornature.org —panda.org or listen to Jim explain some interesting forest facts in this video for kids (and adults).